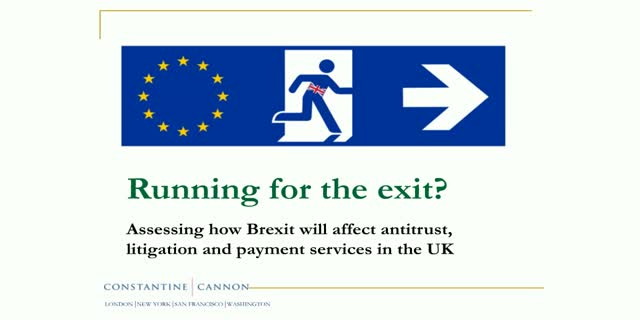 Assessing how Brexit will affect antitrust, litigation and payment services in the UK. Lawyers from the London office of Constantine Cannon LLP address the effects of the referendum vote in their areas of practice, considering the risks and opportunities that lie ahead. Time permitting, any questions submitted in advance will be addressed in the presentation (unless a private response is requested). · Can European defendants still be sued in the English courts? · How will EU competition law apply in English courts in the future? · Will litigation shift to Amsterdam and Berlin? Title: Running for the exit?